Airlie Road – named by George Troup (read more about George Troup) after the family seat of the Ogilvie’s of Airlie. 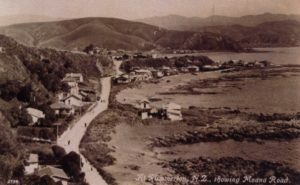 This road was originally known as Pukerua Road. It was changed to Airlie Road on 19th January 1961. Bath Street – named by John Plimmer after the spa town in England. Beach Road – This road leads to the beach. Cedric Place – named after Cedric Jack Tse, 1928-1988. In 1956 he was a civil engineer with the Ministry of Works working on the construction of the Wellington Airport, then in 1960 he was appointed chief engineer with Wright Stephenson & Co (later Fletcher Challenge) managing many land developments and construction projects. Cedric Tse founded the Tse Group in 1965. Cluny Road – named after George Troup, owner and developer of 365 acres of land at Plimmerton after the family seat of the Gordon clan who were his father’s forebears. Corlett Road – Edmund Murray Corlett was a flight sergeant from Plimmerton who was killed in WWII when returning from a raid over Italy. Exeter Street – this was the name given to the stretch of road from the present entry in Plimmerton to the corner of Grays Road. Exeter is near Bath in Wiltshire, England, and continues a number of Plimmerton streets named in connection with John Plimmer. Firth Road – named after Roy Firth, a county council roadman from Plimmerton. Gordon Road – named by George Troup after the Gordon clan of Cluny in Scotland. Grays Road – named after the Gray family. 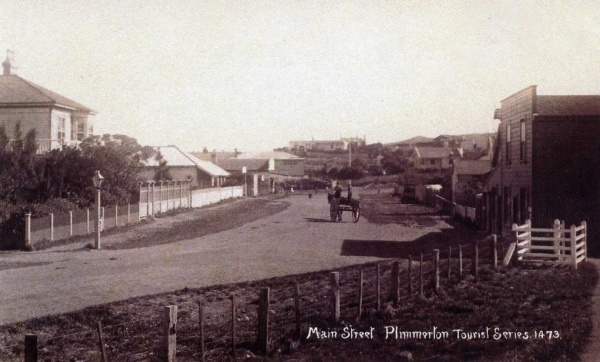 Originally named the Plimmerton-Pauatahanui Road. James Street – named after James Walker, who farmed in the area. Motuhara Road – named after a Maori land block. Moana Road – Moana means sea. Ogilvy Terrace – named after Lady Ogilvie from whom George Troup’s mother Jean was descended. In 1640 Lady Ogilvie became a legend for her defiance of the Duke of Argyll’s forces. Queens Avenue – It was thought that Queens Avenue was named in recognition of Queen Elizabeth II, but the article below is dated 1892 so we now think Queen’s Avenue should be attributed to Queen Victoria who was on the throne at that time. 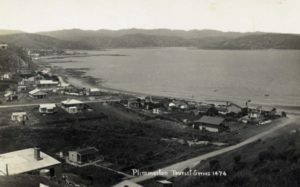 Reserve Road – leads to one of Plimmerton’s oldest reserves. Roy’s Road – after Roy Mulhern, owner of the land that was developed late 1950s-early 1960s. Steyne Avenue – probably named by John Plimmer after The Steyne (pronounced Steen) which was the social centre of Regency Brighton on England’s south coast. Taupo Crescent – named after Taupo pa – a Maori land block. The Track – This was probably part of Pukerua Track (also known as Troup’s Track) which ran from Paremata Bridge to Pukerua Beach. It was originally only a bridle track, made before Paekakariki Hill Road and the railway were formed. Toup’s Road – George Troup was Mayor of Wellington and NZ Railways architect. He designed Dunedin’s Railway Station and was subsequently nicknamed Gingerbread George. He designed and had a stone house built for himself in Motuhara Road and also designed Somme House in Karehana Bay for his brother-in-law Charles Moore. Troup was eventually knighted. Ulric Street – named after Sir Clifford Ulric Plimmer (1905-1988), chair of Wright Stephenson & Co and friend and colleague of Jack Tse who developed the Plimmerton estate. 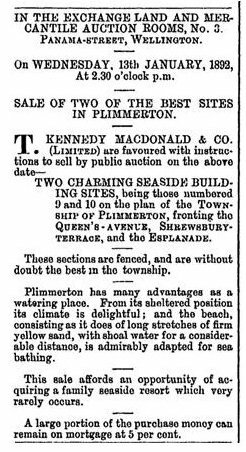 Plimmer developed the pastoral company Wright Stephenson and Co and held many outside directorships. St. Andrews Road – James Walker, who farmed in the area, came from St. Andrews in Scotland. School Road – this road leads to the school. South Beach Road – this road follows the beach to the south.